We would be happy to provide information on reservation of a private room, part of the facility or the entire facility for your special services needs. 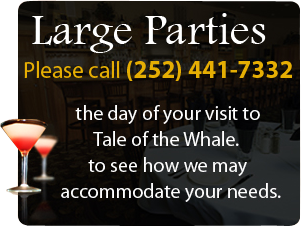 Large parties, please call (252) 441-7332 the day of your visit to Tale of the Whale to see how we may accommodate your needs. 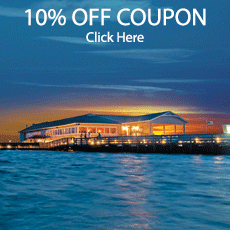 We also offer gift certificates – call (252) 441-7332.Please e-mail us your special services request. Include your name, type of function, number of guests and the date of your event. Please allow 48 hours for a reply. Thank you for considering our facility. Not valid on special events and functions. Excludes alcoholic and specialty bar beverages.